The New England Patriots had plenty of reasons to celebrate after defeating the Los Angeles Rams 13-3 to win their sixth Super Bowl in franchise history in Atlanta on Sunday. 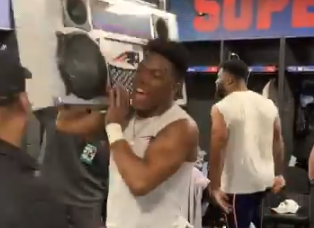 After the win, the Pats blasted Sheck Wes’ hit “Mo Bamba” in their locker room on a hilariously oversized boom box. Multiple Patriots players – and some kids – danced and sung along to the song. Where’d they get that massive boom box? It’s pretty awesome. Congratulations to the Patriots for once again proving they’re the cream of the crop in the NFL. Say what you want about Tom Brady, Bill Belichick, and co., there’s no denying they’re winners and deserve to dance to whatever song they want to after winning another Super Bowl.